Revolutional Musical Change! 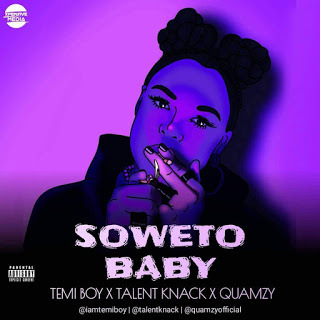 Here comes the Musical temporary almagamation of Three Musical artist, Dishing out a Tremendous quality Volume of Afro, Partial and Rap style of music, fused into one song, Titled SOWETO BABY. With this good quality of musical Artistes are here to stay, Kindly download and enjoy a new musical dimension headed by new Musical art, in our Nigeria Musical Industry, as they gradually take it to the World. The music was properly Scrutinized as they got a DJ who also sings in their midst called TEMI BOY. Along side with TALENT KNACK and QUAMZY. This song is definitely going to be a hit song in Nigeria and across Africa, as they all played their part perfectly well.